Peruvian food is a spectacular fusion of cuisines. And, at the head of the table, is this chef: Gaston Acurio. I spent some time at his flagship restaurant in Lima, Astrid and Gaston, where we talked about the Peruvian food revolution. RESTAURATEUR GASTÓN ACURIO IS HELPING USHER IN A NEW RENAISSANCE FOR INDIGENOUS FOOD IN PERU—AND WITH IT A REBIRTH OF A CULTURE THREATENED WITH EXTINCTION. All eyes are on Gastón Acurio as he walks down the steps of the 300-year-old Casa Moreyra, one of the few remaining haciendas in the upper-class high-rise neighbourhood of San Isidro, Lima, It’s home of Acurio’s flagship restaurant, Astrid y Gaston, and named for his German wife—a fellow chef he met while studying at Paris’ Le Cordon Blue. 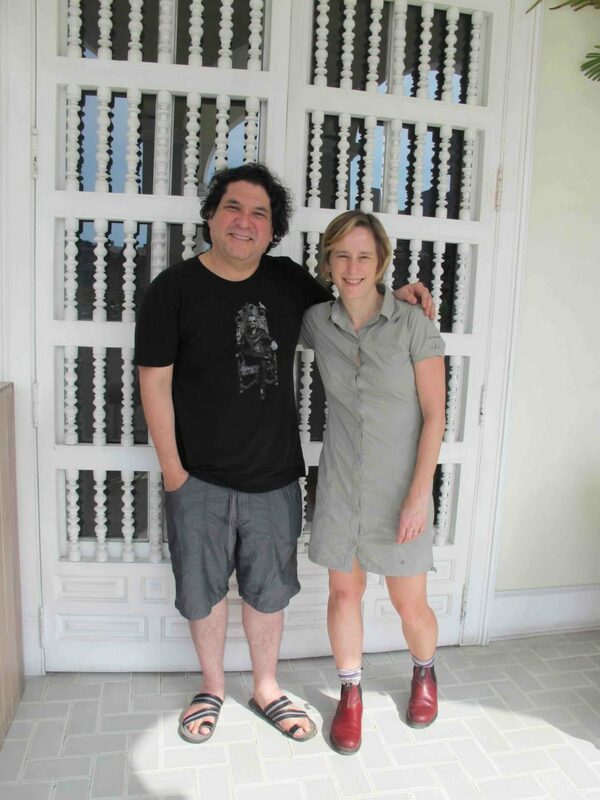 Dressed in beach shorts and flip flops, with unruly black curls hanging in his eyes, he looks more like a surfer than the leader of Peru’s gastronomic renaissance. Today, after travelling to promote Peruvian food (he operates over 60 restaurants in South America and a handful in the US), Acurio has returned to his kitchen. And to meet his staff, he’s organized a Pachamanca, a traditional Inca ceremony of buried potatoes, vegetables, meats and tamales steam-cooked using hot rocks between layers of banana and tea leaves. My plate is piled high with choclo corn in its husk. With kernels almost five times larger than Canadian varieties, it’s also less sweet and nuttier. Then, there are sweet camote potatoes, fava beans, and meat, oh the meat: pork, chicken, beef and the famous cuy (Guinea pig), which tastes like rabbit. But, the next day, whilst dining on a 10-course tasting menu at Astrid y Gaston, I enter a different gastronomic planet: a gourmet version of traditional Peruvian fare. Traditionally a casserole-like stack of cold mashed potatoes and avocado, in Acurio’s version of causa, his mashed potatoes are green from lima beans and a thumb-sized avocado ball explodes into a crispy hash brown. Instead of the traditional lime and fish juice (leche de tigre: tiger’s milk) served in ceviche, Acurio adds pureed rocoto (a red pepper from the south of Peru), topped with elegant potato flowers. It’s salsa meets ballroom dance. According to Acurio, haute Peruvian cuisine has an important role for Peru: “It’s propaganda for our own country, but it also inspires young people—to make them dream and that they can make it with what they are, go further and be proud,” says Acurio. In Lima alone there are 22 gastronomy schools and a foundation to train underprivileged students to become chefs. The Peruvian food ambassador began branding the country’s cuisine in 2006, bringing together the likes of chefs, historians, anthropologists and journalists. It’s a story about food, and with it, a culture that for centuries was stifled by multiple conquests, economic struggles and violence. As recently as the early 1990s, leftist terrorism bombings were commonplace. A curfew meant no one socialized outside their homes, let alone going to a restaurant. If they did, it certainly wasn’t to eat Peruvian food. The roots of Peruvian food are much more related to the values that societies all over the world are recovering now: Celebrating the land, protecting the water, protecting our biodiversity. Peru is blessed with some of the rarest and oldest ingredients on the planet; it is the birthplace of 4,000 varieties of potatoes and 400 chillies. Its Amazonian, mountain and coastal micro-climates allow for exotic and nuanced flavours. Imagine the Andesgrown chuño; after drying in extreme temperatures for a month, the potato turns white and offers a flour that gives a silky texture to sauces. Or, Amazonian heart-ofpalm slivered into pasta-like ribbons on top of ceviche. Every region of the country is included in the New Peruvian cuisine. And, it’s always been that way. When mass immigration began, by conquests or otherwise, Peru’s gastronomic palate fused and grew. Spanish introduced limes to create ceviche. Chinese immigrants brought soy sauce and the wok to create chifa dishes like the lomo saltado, beef stirfry served with rice and Andean potatoes. And a little lesser known, Nikkei, Peruvian/ Japanese, decided to spice up sushi with a kick of chilies. Glad to see you’re eating!